Right now, if you were to go before God in judgement, you would be found guilty and eternally condemned to hell forever. Now here is the good news: You haven't died yet, and God has provided a way for you to be forgiven! 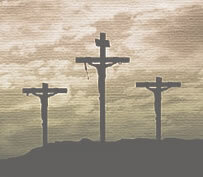 Two thousand years ago God sent his only son - Jesus - to die on the cross to pay for your sin and my sin even though Jesus had never himself sinned in his entire time on earth. Three days later he arose from the grave victorious over death. To help you understand what Jesus has done for you, lets go back to our courtroom example. You have just been found guilty of drug trafficking. The judge is about to give you the full sentence of 20 years in prison when in walks a stranger and says "Judge, I have here a court order from the highest court that allows me to take the place of my friend here (you) to pay their debt. Judge, if the accused will accept this gift of freedom, then I will go to prison on their behalf and pay their debt in full." That is what Jesus has done for you on the cross. He has taken your sins onto Himself and paid your sin debt for you. It was a gift. If someone has a gift for you, what do you need to do for it to be yours? Nothing, its a gift - free! You just need to receive it.